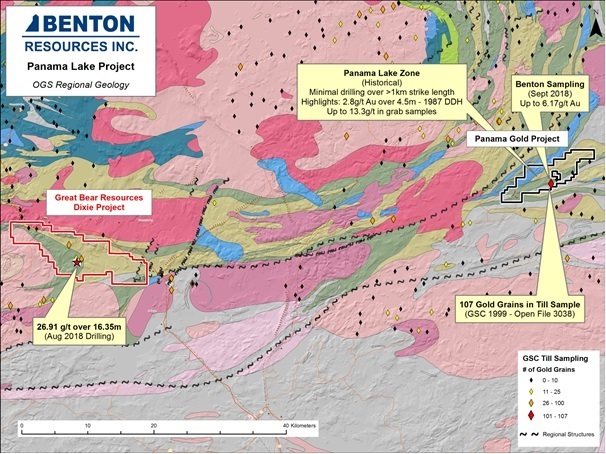 Thunder Bay, Ontario–(Newsfile Corp. – October 18, 2018) – Benton Resources Inc. (TSXV: BEX) (“Benton” or “the Company”) is pleased to announce that it has substantially increased the size of it 100%-owned Panama Lake gold project in the Red Lake mining district to 365 claim cells which now covers approximately 7446 hectares. The Panama Lake project is located 55km northeast of the town of Ear Falls and is accessible by road. The new staking encompasses highly favourable magnetic trends, folding and structural lineation identified from recent prospecting and historical data compilation efforts on the project. The Company’s first results from its initial prospecting program graded between 0.17g/t Au and 6.17g/t Au (see Benton PR dated September 18, 2018) in five samples collected from an altered and silicified sedimentary iron formation containing quartz veining, pyrite, pyrrhotite and arsenopyrite. Further prospecting has now identified additional quartz veins ranging from 15cm to 30cm wide containing arsenopyrite and carbonate alteration within a 4-5m wide felsic shear. In addition, multiple boulders of various size, rich in arsenopyrite and quartz, have been followed over a 800+ metre trend. Prospecting has also located a sulfide-rich, sedimentary iron formation in the direct vicinity of the Geological Survey of Canada (GSC) till sample 92-SBB-142 that contained 107 gold grains. This is one of the highest gold grain counts in the regional-scale survey and the source of the glacially transported gold has yet to be identified. Map(s) can be viewed below and on the Company’s website at www.bentonresources.ca, which illustrates the Panama project in relation to Great Bear Resources Ltd.’s (“Great Bear”) discovery at their Dixie project in the Red Lake mining district (see Great Bear’s press release dated August 22, 2018). Historical work is minimal on the Panama project and the last diamond drill campaign on the property was completed by Noranda Exploration Co. Ltd. in 1988 where eight widely-spaced diamond drill holes over a 1.4km strike-length yielded results of up to 2.8g/t Au over 4.5m within a 20-30m wide mineralized shear zone. In addition, the Company has renegotiated its binding letter of intent (“LOI”) with Matador Capital Pty Ltd. (“Matador”) (See Benton PR dated March 3, 2018). To date, Matador has paid Benton a total of AUD $100,000 within the original LOI and will now pay Benton a one-time final cash payment of AUD $30,000 for a 100% interest in the Providence Ni-Cu-Co-PGM project located in the Northwest Territories. The final agreement and payment will be completed by AGR Resources Pty Ltd. (ACN 624 998 107) (“AGR”) which is an affiliate of Matador. AGR will assume responsibility for the underlying NSR’s on the project (0.75% in favour of Platinum Group Metals and 0.50% in favour of Arctic Star Exploration) and will grant an additional 1% NSR in favour of Benton (2.25% NSR in aggregate) of which 0.5% of Benton’s NSR can be purchased for AUD $1,000,000. Benton Resources Inc. is a well-funded Canadian-based project generator with a diversified property portfolio in Gold-Silver, Nickel, Copper, and Platinum group elements. Benton holds multiple high-grade projects available for option, which can be viewed on the company’s web site. Most projects have an up-to-date NI 43-101 report available. Interested parties can contact Stephen Stares using the contact information below. Forward-looking statements are subject to a variety of risks and uncertainties which could cause actual events or results to differ from those reflected in the forward-looking statements, including, without limitation: risks related to failure to obtain adequate financing on a timely basis and on acceptable terms; risks related to the outcome of legal proceedings; political and regulatory risks associated with mining and exploration; risks related to the maintenance of stock exchange listings; risks related to environmental regulation and liability; the potential for delays in exploration or development activities or the completion of feasibility studies; the uncertainty of profitability; risks and uncertainties relating to the interpretation of drill results, the geology, grade and continuity of mineral deposits; risks related to the inherent uncertainty of production and cost estimates and the potential for unexpected costs and expenses; results of prefeasibility and feasibility studies, and the possibility that future exploration, development or mining results will not be consistent with the Company’s expectations; risks related to gold price and other commodity price fluctuations; and other risks and uncertainties related to the Company’s prospects, properties and business detailed elsewhere in the Company’s disclosure record. Should one or more of these risks and uncertainties materialize, or should underlying assumptions prove incorrect, actual results may vary materially from those described in forward-looking statements. Investors are cautioned against attributing undue certainty to forward-looking statements. These forward looking statements are made as of the date hereof and the Company does not assume any obligation to update or revise them to reflect new events or circumstances. Actual events or results could differ materially from the Company’s expectations or projections. Disclaimer: This is an unedited and minimally reviewed public mining company press release originally published at http://www.newsfilecorp.com/release/40424/Benton-Increases-Panama-Project-Land-Position-in-Red-Lake-Mining-Division-and-Completes-Sale-of-Providence-Project-NWT. We have linked to our knowledge base articles from within the content of this release in order to help explain some of the terminology used and provide continuity from previous and related news coverage. You can access more in-depth mining company project reviews on our site, as well a knowledge base of articles on mineral exploration, mining and geology-related topics.